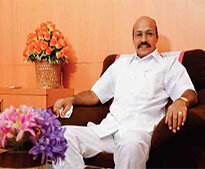 Mr.V.S.Balsamy, B.Sc., L.L.B., a leading luminary, has 31 years of bright standing in the field of law. He is the recipient of “Indira Gandhi Sadhbavana Award” from Global Economic Council, New Delhi. He was also honoured with “The Best Humanitarian Award” in 2005. VSB Educational Trust was founded by him as the Founder-Trustee in the year 2000. He started V.S.B. Engineering College in Karur in the year 2002 and V.S.B. College of Engineering-Technical Campus in Coimbatore in the year of 2012. He, the Correspondent of VSB Group of Institutions, lays emphasis on ‘Hard Work’. As he strongly believes that “HARD WORK IS THE KEY TO SUCCESS”, it is conceived as the motto of the Institutions. Our Institution, a temple of learning and a hallmark of discipline, treads towards the zenith of glory by providing quality education with global standards in the best quality and diversity. 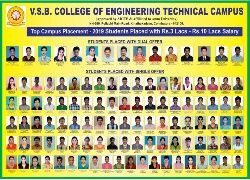 Our college is one of the most eminent Higher Education Institutions today, and it is renowned for the standards of its teaching methodology, facilities and students. By maintaining a team of core faculty members, who are constantly pushing the frontiers of knowledge, we ensure a futuristic approach that keeps pace with the changing trends in the professional world through our global perspective. Dear Students, we invest trust on you. You are our safe source and we bank all our efforts on you. We create not the future instead we craft you for the future. The knowledge that you will gain, the fine qualities that you will imbibe and the technical skills that you will learn to apply will be your major contribution to your parents, to the society, and to the nation. There are strong challenges to great efforts but, always remember, great effort bears the sweet fruit of success. We want you to taste the fruit of success once and for the rest of your life, you will never rest. I convey my best wishes to all the students and their parents for a successful future and good education.